The Gosford club released a statement hours after the match to confirm his departure. The Mariners are bottom of the A-League with just seven points from 21 games. Mulvey, who joined the Mariners before the start of the season, had insisted after the Phoenix defeat that he wouldn't walk away from the job. But the club took the decision out of his hands, saying they had parted ways with him with immediate effect. The statement went on: "With six games remaining in the Hyundai A-League 2018/19 season, the club will issue a statement when a decision has been made regarding who will lead the team during this period. 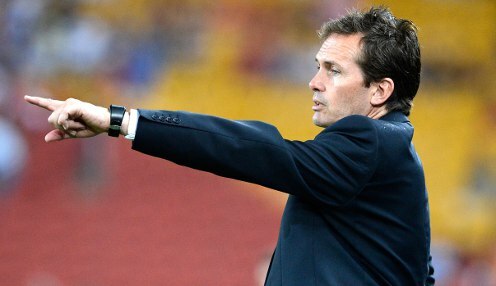 Mulvey led Brisbane Roar to the championship in 2013-14 and was named A-League coach of the year in the same season. But he was sacked early in the following season after winning just one of the first six games. He replaced Paul Okon as Mariners coach last April, after the club had finished with the wooden spoon. The Mariners were in the spotlight during pre-season as they gave Usain Bolt the chance to earn a professional deal, but it didn't work out for the former Olympic legend. The club's hopes that Scotland international striker Ross McCormack would fire them to success were dashed when he was injured - he scored just one goal in five games during his loan spell from Aston Villa. Central Coast have only won one game all season and have conceded 13 goals in their last two games. Mulvey had said after the Wellington game: "You could tell it was a little bit of a toxic atmosphere tonight, a lot of negativity around the place and that doesn't help. I don't blame the fans - it is a symptom of where we are now." Central Coast are 15/2 to win their next game against Newcastle Jets, who are 3/10 with the draw 19/4. The Mariners are 28/1 to win 1-0.